A few years ago we had tons of heart valentine cookies leftover and I didn't know what to do with them. So I stuck them in the freezer. 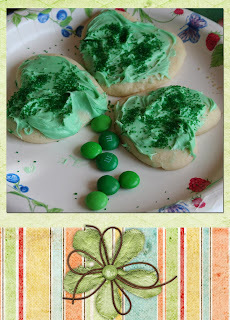 On St. Patrick's Day, I remembered them when it was cookie decorating time and we came up with this variation that was super easy and fun. Frost all 3 cookies and sprinkle them with green sprinkles. Lay them in a clover formation and then you can either lay the the m&ms directly on the plate or place dab of frosting beneath them to "stick" them to the plate. These were fun. If you didn't freeze your cookies, you can simply make more heart cookies :) Lots more St. Patrick's ideas to come!